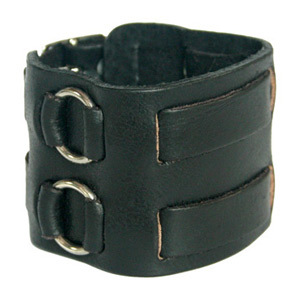 The Thai leather jewelry artisans present a sturdy wristband bracelet for men and women. The artisans contrast the strong black leather with shiny metallic fixtures. 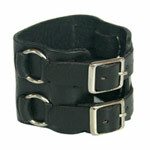 The bracelet closes with 2 buckles and is adjustable for 4 wrist sizes. Size: Adjustable for 4 wrist sizes. Open (Flat): 26.5 cm length x 5.5 cm width. Closed (Maximum wrist length): 20.0 cm length x 5.5 cm width. Closed (Minimum wrist length): 15.0 cm length x 5.5 cm width.